The classic exterior of this lovely early 19th century structure on Brown's Main Green disguises its bustling inner vitality as a hub of Brown's religious life. The spare elegance of this space ideally suits it to the variety of Brown's life. 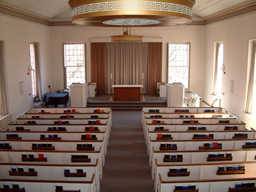 Manning Chapel is available for weddings, baptisms, and memorial services. All members of the Brown community receive first priority in reserving it for personal ceremonies. Please call the Office of the Chaplains and Religious Life at 401-863-2344 for additional information. 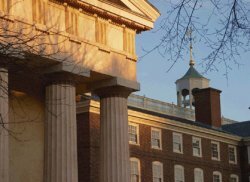 Manning Hall was built in 1834 at the expense of Nicholas Brown and named at his request for President Manning. It is said to have cost $18,500, and is an exact model, though twice the size, of the temple of Diana-Propylea in Eleusis, the plan having been obtained from a work published in 1817, entitled The Unedited Antiquities of Attica, comprising the Architectural Remains of Eleusis, Rhamnus, and Thericus. "This College edifice, the third which has been erected, is built of stone. Including the portico, it is about ninety feet in length, by forty-two in width. Its height, from the top of the basement, is forty feet. The Library occupies the whole of the first floor, and is a beautiful room. In the centre, it is ornamented with a double row of fluted columns. The Library is sixty-four feet by thirty-eight, and is thirteen feet high. The Chapel is on the second floor. It exhibits the most graceful proportions. Its length and breadth are the same as those of the Library. Its height, however, is not less than twenty-five feet. The front of the edifice is ornamented with four fluted columns, resting on a platform projecting thirteen feet from the walls. Manning Hall is situated between University Hall and Hope College, equidistant from each. It is of the Doric order, and is said to be one of the finest specimens to be found in the country. Mr. Russell Warren was the architect; Mr. Daniel Hale, the master mason; and Messrs Tallman & Bucklin, the master builders." In a somewhat contradictory account written by Providence architect John Hutchens Cady '03 in 1934 for the hundredth anniversary of the building, he wrote, "Two influences doubtless, were instrumental in causing its architect, James C. Bucklin, to design this building in accordance with Greek traditions, namely his familiarity with that style, as exemplified by the Arcade which he had recently designed in collaboration with Russell Warren, and his desire to give the hall an academic appearance." Reuben Guild described in his History of Brown University in 1867 how the shelves of the library extended from the columns in the middle of the room to the walls forming ten alcoves, and how already extra shelves had been built in every available space. Photographs of the library in the 1870s show piles of books on the floor around the columns. The upper story, the chapel, was reached by a double flight of stairs from the vestibule. There was a balcony on the west wall of the chapel; at the east end a raised platform for the pulpit, enclosed by a fence and entered by double swinging doors. At some time a Mason and Hamlin organ was installed in front of the pulpit on the same level as the seats, placed so that the organist faced the students. In 1874 Albert G. Upham was paid twenty dollars to play the organ for the academic year. The chapel was redecorated in 1857 with funds from Robert Hale Ives and the late Moses Brown Ives and a marble tablet in memory of Nicholas Brown was placed on the east wall. Interior of Manning ChapelThere was no basement until the 1850s when one was excavated. The building was heated by stoves which were replaced by the introduction of steam heat in 1886; gas was introduced into the building about 1873. The library removed to the new library building (now Robinson Hall) in 1878, and, after the renovation of University Hall in 1883, the president's lecture room was located in the lower floor of Manning Hall. The chapel remained, but was also being used for more mundane purposes as President Robinson noted in his report of 1886, "The other than religious uses to which Manning Hall is not infrequently given up have stocked it with associations that are by no means congenial with the spirit of devotion." Chapel services were held in Sayles Hall after 1894, when the upper floor of Manning became a room for architectural and freehand drawing. On March 8, 1959 Manning Chapel was rededicated to its original function. The second floor of Manning Hall had been restored with a $49,000 grant from the James Foundation. Thomas Mott Shaw was architect of the restoration, and Mary L. Crosby of Courtright House, Inc. of Boston was the decorator. The pipe organ was executed by the Wicks Organ Company of Highland, Illinois according to specifications provided by Professor William Dinneen. The new chapel had two new bronze chandeliers and seating for two hundred. The rear wall of the altar was draped in two shades of green, and the six-foot mahogany cross of that wall of the multi-faith chapel could be covered by the drapes for non-Christian services. The first service in the restored chapel was held on February 15, 1959, the occasion being the Universal Day of Prayer for Students. The lower floor of Manning Hall is still a classroom. The above entry appears in Encyclopedia Brunoniana by Martha Mitchell, copyright ©1993 by the Brown University Library.